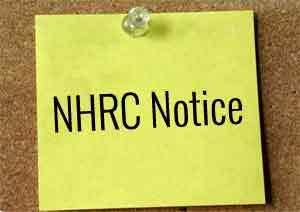 New Delhi: The National Human Rights Commission (NHRC) has issued a notice to the Government of Uttar Pradesh, through its Chief Secretary, calling for a detailed report in the matter of several deaths of children in the BRD Medical College, Gorakhpur, along with the steps taken for relief and rehabilitation of the affected families as well as action taken against the guilty officers within four weeks. The notice follows the suo motu cognizance taken by the Commission of several media reports hinting at negligence in the supply of liquid oxygen at the hospital which resulted in the tragedy. The Commission has observed that reported deaths, in such a large number in a government run hospital, amount to serious violation of Right to Life and Health of the innocent victims. This indicates towards gross callousness on part of the hospital administration and the Medical Education and Health Department of the Government of Uttar Pradesh. Earlier also, it has come across several instances of deaths in the hospitals due to Japanese Encephalitis. The Commission has further observed that the issue of deaths due to Japanese Encephalitis was discussed with the Chief Secretary and other senior officers of the State Government in detail during its recently concluded Open Hearing and Camp Sitting at Lucknow for the cases of Uttar Pradesh from the 9th to 11th August 2017. However, in spite of assurance given by the state administration, the situation has not improved. According to the various media reports, carried since 12th to 14th August 2017, by the most of the Hindi and English newspapers, the private firm, contracted to supply liquid oxygen to the BRD Medical College, stopped the supplies, as it was not paid the outstanding dues of almost Rs. 70 Lakh and the result were tragic deaths of about 60 children, admitted in the Neo-natal and Encephalitis Wards of the hospital. As per media reports, the magisterial inquiry has been ordered by the administration to ascertain the cause of death. In the last three decades, Japanese Encephalitis (JE) and Acute Encephalitis Syndrome (AES) have claimed over 50,000 lives in the eastern Uttar Pradesh, mostly in the Gorakhpur district. It is further mentioned that total 124 deaths were reported in the hospital till 8th August 2017. 641 children died last year and 491 in the year 2015.